Kottas on Dressage is a distillation of practice and philosophy of one of the most highly regarded international trainers of the current era. Having stressed the need for the rider to establish correct posture and a thorough understanding of the aids before attempting to train the horse, the book goes on to highlight the value of establishing rapport with the horse and enhancing his mental responses and developing his physique with groundwork, before progressing to work under saddle. 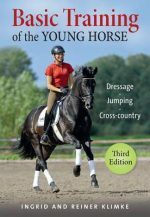 Following this, the text focuses on thorough, incremental development of the basic gaits, as well as including chapters on: the rider’s position, training the rider on the lunge, training the horse on the ground, the walk, the trot, the canter and counter-canter, flying changes of lead at counter, the lateral exercises and piaffe and passage.